"We're hoping that Bill C-262 will be that one step to really make a push, a change within the government itself," Bishop Chris Harper said. Representatives and public supporters gathered at the Francis Morrison Library Theatre on Saturday afternoon to rally for Bill C-262 — a federal bill that would be seen as a huge success for the Indigenous peoples of Canada if passed. Bill C-262 was brought to parliament as “an Act to ensure that the laws of Canada are in harmony with the United Nations Declaration on the Rights of Indigenous Peoples,” according to the text of the bill. Referred to more colloquially as the United Nations Declaration on the Rights of Indigenous Peoples Act, the aim of the bill is to bring the tenets set out in the declaration adopted by the UN back in 2007 in line with Canadian law. Supporters of the bill say the legislation could provide a framework for reconciliation to move forward in Canada. According to Bishop Chris Harper with the Anglican Diocese in Saskatoon, it has the potential to positively impact the official Calls to Action already laid out by the federal government. “We’re hoping that Bill C-262 will be that one step to really make a push, a change within the government itself for the wider population … for us to again walk with a little respect and dignity for the history of our people and our communities,” Harper said. The rally at the Francis Morrison Library in downtown Saskatoon brought together delegates from around the city who support the bill, including NDP MP Sheri Benson, Harry Lafond from the Muskeg Lake Cree Nation, Bishop Chris Harper, and Senator Lillian Dyck from Gordon First Nation. Saskatoon Tribal Council Chief Mark Arcand also voiced his support. “I find it very important that we lobby the senate, we lobby the federal government, we lobby the provincial government, to recognize the rights of Indigenous people,” Arcand said. Arcand pointed to a number of cases in the city as examples of still-missing equal rights for Indigenous citizens, including the recent debates over creating an Indigenous preschool in the Montgomery Place neighbourhood. Arcand described being in city hall meetings when letters received from neighbourhood residents during the consultation process were overwhelmingly opposed to the school. Bill C-262 is “sitting at the doors of the senate,” according to Harper. As the fate of the bill is set to be decided, Harper said this is a decision at the federal level with the potential to impact how Canada considers both the past and future of Indigenous culture. Another article in the Eagle Feather News is well worth reading. Click here to go to the article. 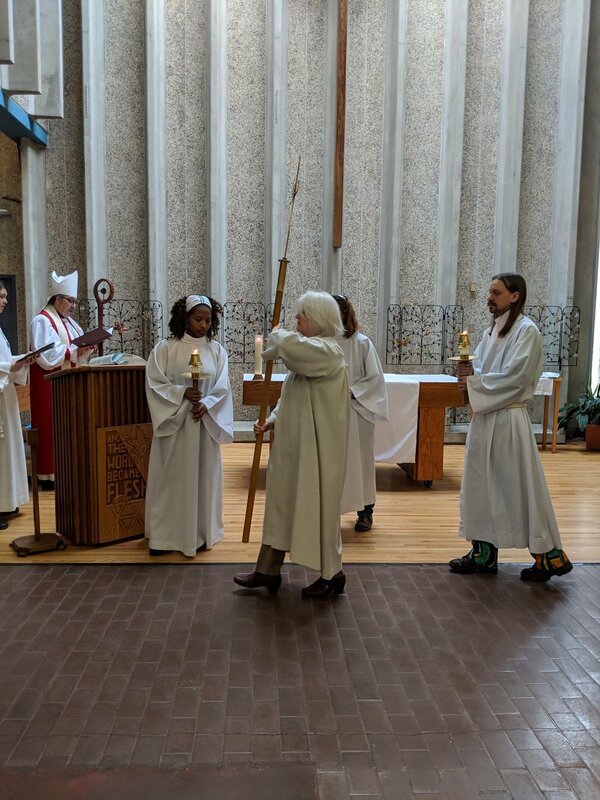 We attended a lovely service of Holy Communion, commemorating St. Chad, Bishop of the Northumbrians and subsequently Bishop of the Mercians and Lindsey People, and the patron saint of the college. St. Stephen’s vision statement reads: We seek to be a Christ Centred, Holy Spirit led, Caring Community that is Outward Focussed. We try to live this out in our day to day life and ministry, and along with every parish, we are always looking for new ways to share the good news of Jesus with those around us. This past winter, we embarked on a new partnership with Saskatoon Open Door Society and became a host for English Conversation Circles. English Conversation circles provide an opportunity for people who are new to Canada to practice their English in an informal setting. Our church has 15 registered volunteers who sign up to help with this! We have very small groups, (3-5) which is pretty typical throughout the city at this time of year and enables us to be one on one with participants. We have hosted people from Eritrea, Iran, China, and Ethiopia. We simply welcome people here, break out the conversation tools and chat, learning from each other. For us, this is a practical way to reach out to people who need help—English is an invaluable tool for new Canadians, and a gift we have to give. Our motivation as a church is to share God’s love with those around, in whatever way we can. This is one way we are able to do this. The best part is the inevitable laughter that can be heard in these sessions among participants and parishioners. Try explaining crokinole, tobogganing and ice fishing without laughing! We offer this small, mustard seed experience as a way to encourage others as they seek to be caring, outward focussed communities. We would love to hear other experiences from churches. 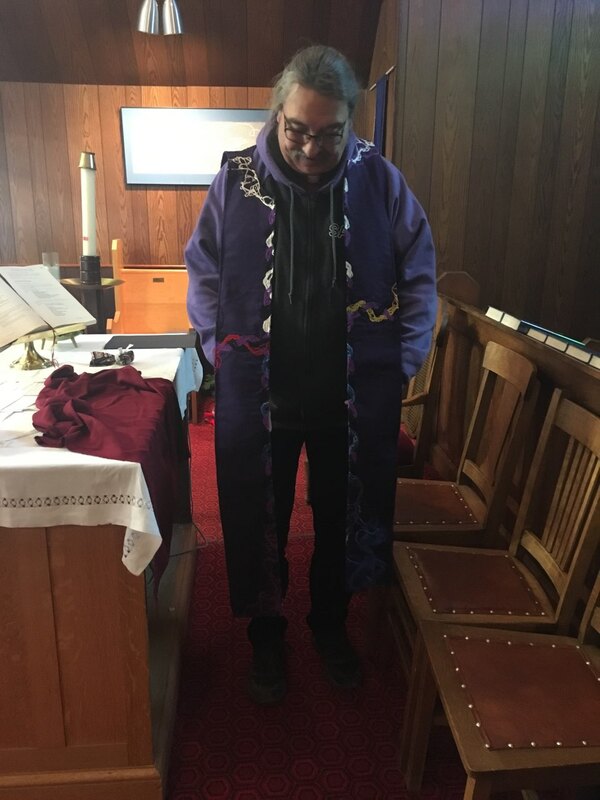 The following article was written by Cindy Hoppe, a textile artist, who made the Reconciliation stole for Bishop Chris. Thank you Cindy for sharing this with all of us. I connected with an old friend from Co-op store days, Brad Wudrich, now an ordained United Church minister, at the Evangelical Lutheran Church In Canada, Saskatchewan Synod, Convention last June. He had told me years ago of his plan to go into ministry after retiring from the Co-op retail system. 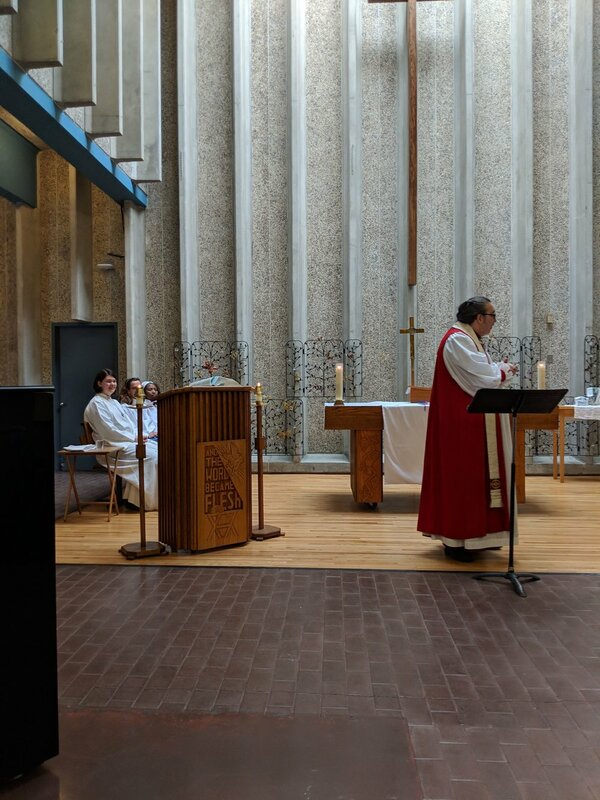 We reconnected at the Lutheran convention as he is now in a shared ministry, ‘Partners in Worship,’ serving Lutherans and United Church folk in Shell Lake. I had promised him a stole and he told me that Reconciliation was really resonating with him. To me, Reconciliation and Lent walk the same path, and as a maker of stoles, I like to do a 2 in one, and pair Advent with Lent. I used a Reconciliation symbol from the City of Saskatoon with accompanying explanation for Brad’s stole but also wanted to follow my own idea in another stole. I used the 4 directions, the cross, and a sweet grass braid as my starting point. The threads are tangled and stressed at the outer edges, coming into a braid as they form the cross. I adjusted the traditional colours of the 4 directions a bit by including blue, but some First Nations recognize blue, and because black has been included in all the braids, it is certainly present and has a larger significance for the Lenten season. To me, the braid is a Trinity symbol, and blue brings us back to baptism. 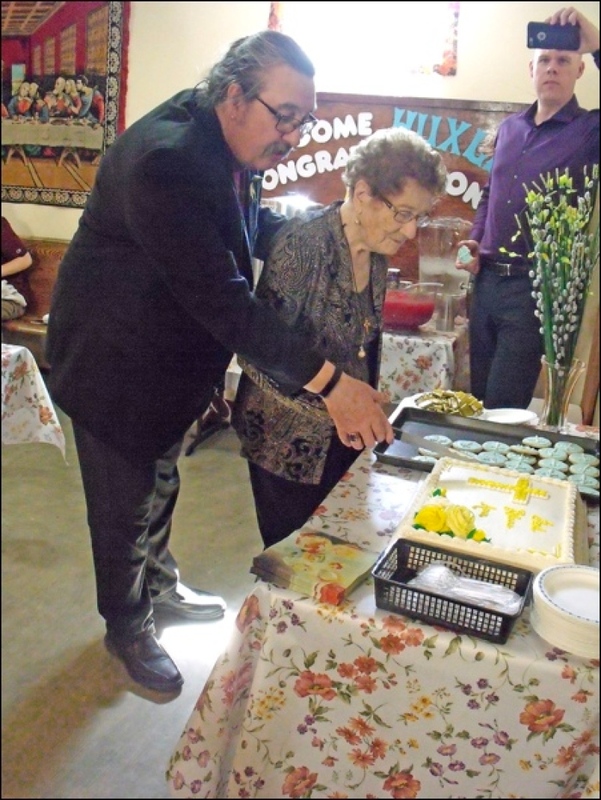 I have been part of a shared ministry, in Biggar, between St. Paul’s Anglican and Redeemer Lutheran, for 20 years. I also had the privilege of serving as a school trustee for a First Nations public school for 5 years. I don’t pretend to know what I am doing on this Reconciliation Road, but Roger and Mary Ann Assailly’s experiences of the Truth and Reconciliation gatherings were related to me and Brad’s wish ignited this response in me. 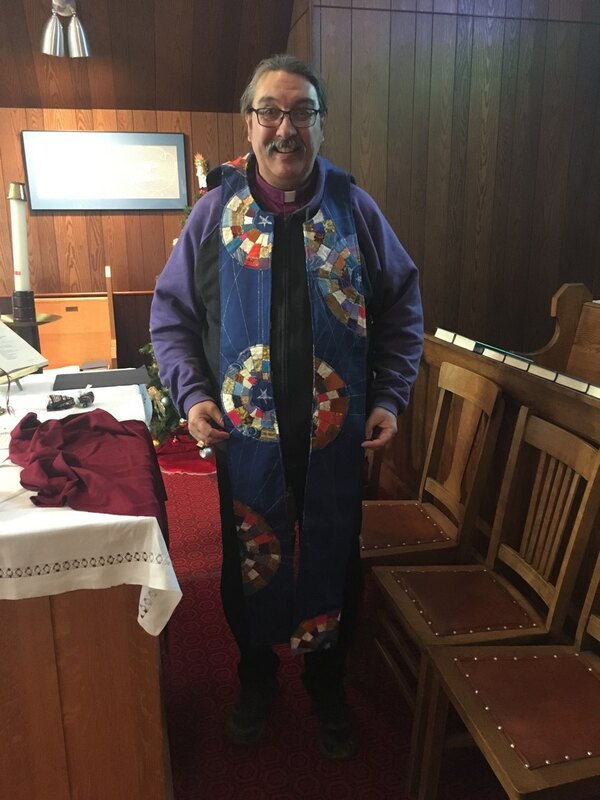 When I heard of Bishop Chris Harper’s election, I knew where I wanted this stole to go. Bishop Chris was coming to visit Pastor Sarah Mowat in Biggar before Christmas as he was going to preside over a confirmation service on December 23. I had visited Mary Ann with the stole and she guided me in gifting protocol. It turned out that freezing rain messed with my plans to present it personally to Bishop Chris, but I left it with Sarah and she delivered it. 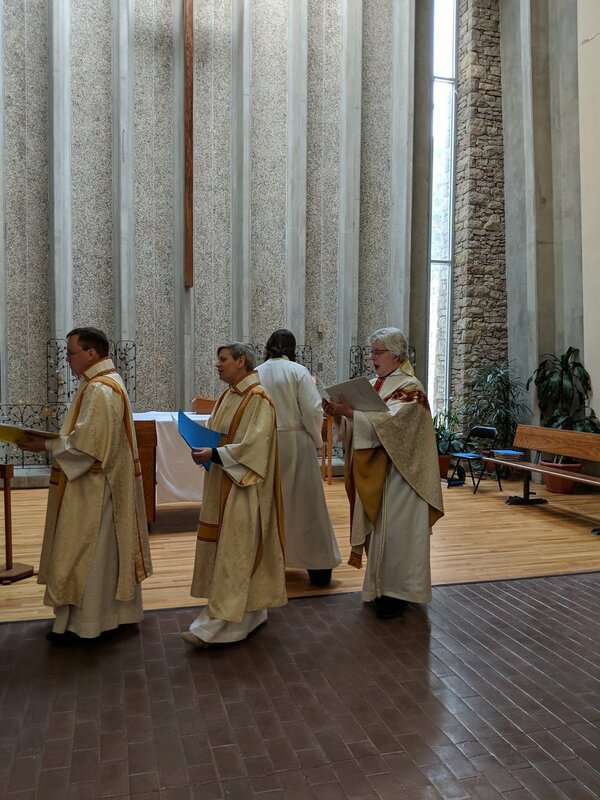 It was a joy to see that the Holy Spirit might have been channelling this project from the beginning, as Bishop Chris donned the stole during Communion and it fits him beautifully. It was a blessing to see Bishop Chris’s Crozier, made for him by his son, with the 4 directions incorporated into it and the beautiful purple heartwood laminated through the centre. The service was a celebration for many of us in different ways and a homecoming for a piece of creative work that I can trace back to friendships, life experience and a new awareness of walking together going forward. All photographs courtesy of the Reverend Sarah Mowat. Top two photos show the Advent side and the bottom photos show the Reconciliation side.